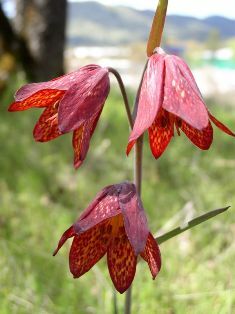 Gentner’s fritillary (Fritillaria gentneri) is a red-flowering herb that is part of the Liliaceae or lily family. It is endemic (found nowhere else but here) to Jackson and Josephine counties in southwest Oregon, including one recently found small population in Siskiyou County of northern California near the Oregon-California border. Gentner’s fritillary grows at elevations below 4,450 feet in dry, open woodlands of fir and oak. The stems and leaves have a bluish waxy coating that is sometimes mottled with purple. It has arrow-shaped leaves and the flowers are solitary from a branched flowering stem. Gentner’s fritillary looks similar to scarlet fritillary (Fritillaria recurva). The only difference is the length at which the style, part of the female reproductive organ, is split. In Gentner’s fritillary, the style splits at one half its length and in scarlet fritillary, the style splits at one-fourth to one-third its length. It is difficult to count the total population for Gentner’s fritillary because bulbs can lay dormant for several years, thus they do not produce stems and flowers. Counting the total population is impossible without seeing the stems or flowers. The current estimated total population is 1,696 flowering individuals. In 2001, an inventory of 46 macroplots was assessed. Of the 46 plots, 22 (48%) contained 1 to 5 flowering plants, 20 (43%) contained 6 to 50 and 4 (9%) contained greater than 50. Because the number of individual flowering plants is typically low in each macroplot, extirpation (local extinction) of these populations is high due to habitat loss. The main threats to Gentner’s fritillary include habitat loss due to development, which can wipe out entire populations. Since 1982, eight populations have been extirpated due to agricultural development and construction of homes, schools, roads and driveways. Also, vehicle use on logging roads on Federal lands destroys habitat. Hikers, bikers, and horseback riders pick flowers growing along trail sides. Horticulturalists dig up bulbs for cultivation. In addition, exotic yellow star thistle invades their habitat and the herbicides used to control star thistle is a major threat to Gentner’s fritillary. Gentner’s fritillary can thrive from natural disturbance, such as fire, and light, human-induced disturbance such as hiking. It grows in Oregon white oak woodlands, California black oak, Oregon white oak and madrone mixed hardwood forests, and Douglas-fir and madrone coniferous forests. Within the Oregon white oak woodlands, Gentner’s fritillary is endangered throughout its range. In the mixed hardwood and coniferous forests, it is threatened throughout its range. Gentner’s fritillary was listed under the Endangered Species Act by the United States Department of Fish and Wildlife on December 10, 1999. Under this listing, Gentner’s fritillary is protected on public and private lands. Gentner’s fritillary is also protected under the Oregon Wildflower Law, Oregon Endangered Species Act and Oregon Administrative Rules, and is listed as a “G1” species under the Oregon Natural Heritage Information Center.